This week one of my characters stepped out of the SH!T – (this should have been ship) whilst another ‘dialectally’ cut his food. Another went to borrow a book and had a conversation with a Libyan who was printing something off on her brothel printer. After all this I needed to have a drink so I headed to the nearest bra. 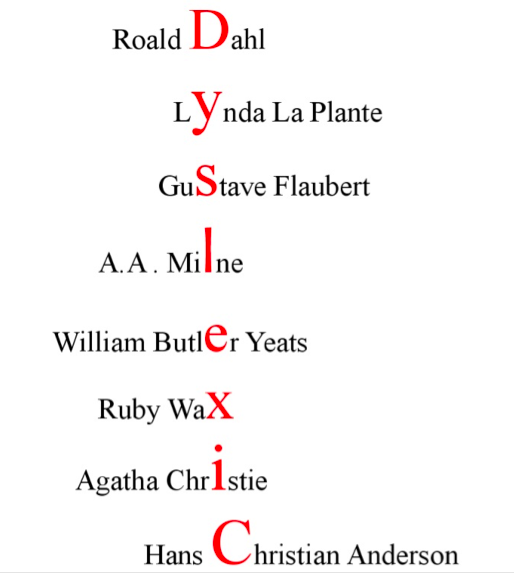 Writing with dyslexia has it perils, most of them not too bad although in a recent submission (which I’d checked and re-checked), I noticed after I’d pressed send that the second word was spelt wrong; I’d spelt Witch with a B at the front (it was a 6-9 comedy). Needless to say I didn’t hear back! I'm dyslexic, but I'm also an optimist so I focus on the positive. Spell checker - it is one of the things I rely on although it is by no way dyslexia proof. 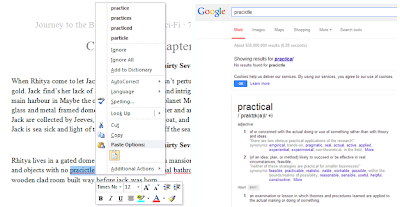 Here are a few tips I learnt about getting the best out of spell check. 1. On a fairly regular basis it breaks, it actually has a strop about the sheer quantity of errors and shuts itself off. IGNORE THIS AT YOUR PERIL, AS IT’LL STOP HIGHLIGHTING AND PICKING UP ERRORS - this is not something you want to discover at the end of an 80,000 document believe me. 2. If you are writing dialogue or have lots of your own made up words, create a custom dictionary. CAUTION – get someone you trust to check that you’ve spelt it correctly before you add it – otherwise you’re allowing misspelling to go unchecked. 3. If spell check can’t recognise what you’re trying to spell, copy and paste it into the GOOGLE search bar, this will usually bring it up first time. It's because google has on file the list of what everyone searches for including the misspelling and what they click on, so they have a great wealth of experience with a bad speller. This usually gets you the correct word. I have a grammar cheat sheet which I refer to that’s hung up by the PC which is a quick reference to; which which is which, and which their, there, they’re to use. I write all my tweets in word and then copy and paste them into twitter to ensure my spelling is correct. Whilst blogging – I write in word and check, then paste in blogger and check, then read through once it’s published as seeing it on the actual platform makes it easier to spot mistakes, then I edit to correct them. Then I promote the blog. It’s time consuming but it’s worth it! I work visually like many dyslexics, so I use sketchpads and notice boards to keep my notes and character info etc, so it's easy to see what they look like and remember where all the information is. Let yourself be free - get the story out then convert it into something readable. Don’t worry about any of it - spelling, grammar, in the first draft – get it done, get it written and then edit. If you worry about it you’ll be in danger that it’ll stifle your creativity, you’ll get writers' block and give up. Let yourself be free, get the story out and then convert it into readable English when you edit! Sally Poyton organises The London Professional Series with David Richardson. She writes mostly YA Fantasy. Up until 2011 it was a secret pursuit, but now Sally's come out of the writing closest. She's dyslexic, so writing is not without its difficulties but she LOVES it. Sally is also an author on Space on the Bookshelf, a blog that celebrates children's literature with reviews, views and more. I believe that the writer of Maggot Moon - Sally Gardner - is also dyslexic? HI Amanada, yes you're right, and her portrayal dyslexia in Maggot moon is spot on! A very inspiring post. 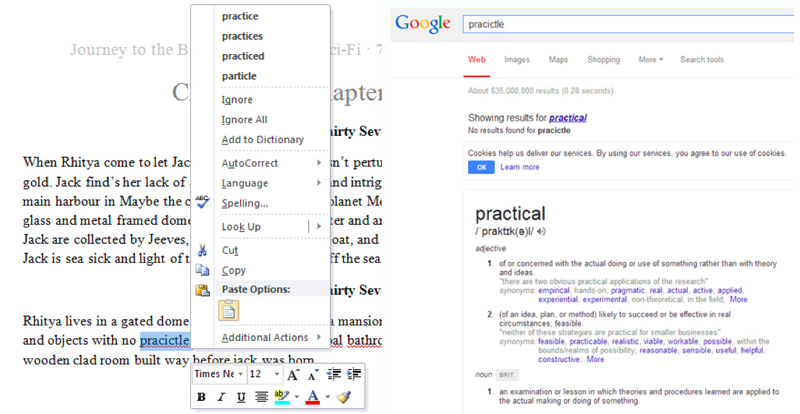 Out of interest do you (or any other writers with dyslexia ever use any of the free add-ons for Word like 'My Study Bar'? http://eduapps.org/?page_id=7 I recommend it alot to the university students with dyslexia who I work with. It's got a dyslexia friendly spell checker and text to speech facility etc. 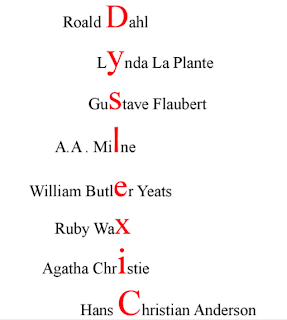 Also, where did you get the graphic of the dyslexic authors names spelling out dyslexia? Would love to use it for dyslexia awareness week (next week in Scotland!). 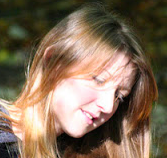 HI Louise, thanks you, i always think dyslexia is as much as a gift as it is a challenge. I'd not heard of My Study Bar but i'll check it out. This is so inspiring! Terrific advice ... even fir non authoring dyslexics! I know of at least three other SCBWI members who are dyslexic. I find their determination to create amazing stories inspiring. Completely agree with Maureen, yes your 'determination to create amazing stories is inspiring' Sally! I argee wiht evrie word you worte! I also only ever do internet through google chrome because it has an inbuilt spell checker. And it deosn;t matter how many times I check somthing there will always be mistakes left. That's because I actually see what I think I've written and not what I really have. Recently I even spelt my name wrong but couldn't tell. And I meant to tell you, I didn't get a proper diagnosis on my dyslexia till I was on the third year of my English degree. I fact I've always been a bit proud of. I think it says something about my determination and ability to adapt. Thank you very much for persevering with them, George! The grammar corrector online free is a grammar checker that finds common spelling errors and grammatical mistakes in English.